Content marketing is a tool that is beneficial for businesses of all industries. When combined with an inbound marketing strategy, content marketing will allow you to create, produce, and distribute content with the goal of attracting new visitors and converting them to new customers. However, to do this, you must first know what content marketing is, why it’s important, and how to successfully execute it for your own company. Content marketing uses content that has been designed with a goal in mind to convert new visitors into leads and customers. The goal of the content is typically to educate or answer questions that are normally asked by your target audience and your specific buyer personas. There are many different ways and types of content that can be used to reach your target audience, especially if you have more than one. By creating a variety of content pieces that can be distributed across many different channels (blogs, social media, videos, etc. ), you will be able to reach each of your audiences and engage with them during every stage of their buyer’s journey. This begins with their first initial visit or interaction with your company. Since your product or service is most likely designed to solve a problem, the first pieces of content your audience interacts with should inform and educate your audience about their problem. They should then progress on to pieces of content that address the solution to their problem, followed by content that proves to them that your product or service is the solution to their problem. Content marketing is not just for new visitors or leads - it is also designed to keep your current customers happy and returning to your company. While your content should prove to new leads that you are the solution to their problem, you should also have content in place to support customers who have already chosen you as the solution to their problem to keep them satisfied and coming back for more. In today’s world, you more than likely have a number of competitors in your industry with a similar product or service. To differentiate yourself from these competitors, you need to be able to prove to your visitors, leads, and customers at every step of the way that YOU are the answer to their problems. This is done by providing them with content that informs, educates, and proves to them that you are different and worth listening to. One of the largest reasons why a content strategy is important for every business is that it creates longer lasting effects than any one marketing or advertising campaign can produce. While other types of marketing strategies and campaigns may work quickly to produce results, your content marketing campaign - if executed correctly - will continue to bring in leads or retain current customers due to the longevity of your content. To give an example, if you run a paid social media campaign with the goal of getting more email subscriptions, you pay a certain amount for the advertisement to run for one month. During that month, you could get 50 new email subscriptions. However, at the end of the month, you would need to continue paying to see the same results next month. While there is a time and place for a paid social campaign, you might not always have the resources to continue investing in campaigns like this. However, if you also have a blog post that is educational and reaches out to your target audience during their buyer’s journey, you could use that to distribute a download or offer to that audience. Let’s say in the same month, you only received 5 emails from that downloadable offer. However, at the end of the month and in the months to follow, the same blog post is still there, it is still relevant, and it is still generating new leads at no additional cost to you. Now that we’ve defined content marketing and learned why it is important, we must begin to create a strategy for content marketing. Although the premise of content marketing may seem easy enough - content - it still requires a strategy to determine your goals, your content, responsibilities, distribution, editing and updating, and more. The easiest way we’ve found to organize and create a content marketing strategy is to do it by topic clusters. In your research on your buyer persona and target audience, you should learn what is important to them and what they are searching for as it pertains to your product or service. Once you have determined which topics they are searching for, you can begin to create clusters of content surrounding these topics. After you have defined your content topics, you must then work to create a publishing strategy and calendar to truly see effective results from content marketing. This includes what type of content you will publish, where you will distribute it, who will create it, when it will be published, and more. Although this may seem overwhelming, we have created a checklist for you to work your way through as you create and develop your own content marketing strategy for your company. Every content marketing strategy should begin with a goal. While each piece of content should have a goal in and of itself, this strategy goal should answer the question of why do you want to use content marketing and how will it help you reach your business goals? We recommend using SMART goals as you begin developing your content strategy. These goals will allow you to reach achievable and tangible results from your content marketing efforts. To reach the correct people with your content marketing strategy, you must know who your target audience is. The best way we found to do this is by creating a buyer persona, or an ideal customer or customers who you would like to reach with your marketing efforts. If you already have this developed from other marketing strategies or campaigns, you are one step ahead! If not or if you would like to revisit or reach a new audience, we have a template to help you create and develop your own buyer persona. Maybe you already have a blog with a few articles published or some videos on your website. Even though your current content was not created within your new content marketing strategy, you can still use it to determine where to begin. If your blogs seem to be doing well, that could be a great place to start. You could also consider creating an ebook, a case study, or some other form of downloadable content to add to your blogs as the next step for your visitors. If your blogs are not doing well, you have no content to review, or you just want to start from scratch, try determining a few other types of content that would resonate with your buyer persona. This could include social media posts, videos, emails, monthly reports, and more. One of the most important parts of a content marketing strategy is how you will manage your content. At i5 Web Design, we like to use HubSpot as a tool to strategize, create, publish, and track all of our content marketing efforts. Other options could include managing your content through your Google Drive and Google Calendar or WordPress. We also offer a template for a content calendar sample that we use for our own clients. At minimum though, you need to have a way to keep track of what content will be created, when and if it has been published and a way to analyze the results of the content you distribute. After you have completed the planning part of the strategy, it’s time to get creative! Use the topic clusters you came up with and begin coming up with ideas for your content. We like to plan out our content about 3 months in advance leaving a little wiggle room for any urgent pieces that need to be produced (breaking industry news, etc.). If you’re stuck and can’t think of content ideas, we have some suggestions on how to choose a topic here. You could also take a look at what some of your industry peers are putting out there and see if that inspires a way to make your own content special and unique. A variety of content can be helpful, but make sure that your target audience will consume the content in the form you put out there. If your target audience research shows that your ideal customer prefers watching videos over reading articles, then it would make sense to put more time into videos and similar content than spending time writing an entire eBook. However, you could still produce blog articles, infographics, and downloads to create variety in your content. Once your content has been planned and produced, it must be published. The best way to keep track of publishing your content is through a content calendar. If you use a tool like HubSpot, you will have access to a content calendar with its own analytics built right in. Whether you use a tool like HubSpot or you use your own content calendar, you should have a tool to track and analyze the results of your content. This will allow you to learn what works, what doesn’t, and what changes you can make for a more successful future. One of the best ways we found to track metrics from your content marketing campaigns is our Marketing Metrics Calculator. This will help you gather the data that is relevant to your company's actual sales and determine the monetary success of your campaigns. Content Marketing is a valuable strategy for businesses across all industries. As long as you have customers, whether they are other businesses or consumers, you will have people who are looking for answers about your product or service. 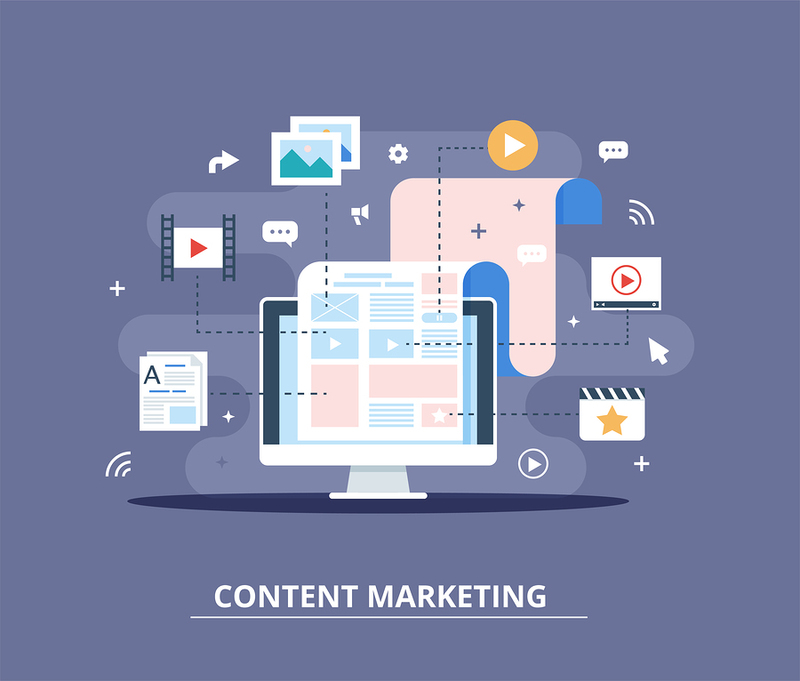 Content marketing provides you with a cost-effective way to not only answer one person, but many different people who are looking for the same answers at every stage in their buyer’s journey from visitor to existing customers. Your website is one of the most important tools you have for your content marketing strategy. Apply for a FREE website assessment today to see how your is doing!